i am not collecting labels, artists, or "records" as such..i collect what i find to be good music, BUT there were certain labels that were quite special, and SVEK is definitely one of those..let's say 5 labels that are given their separate shelf. Even guys that you might considered to be generic loop techno producers turned into proper musician once they appeared on SVEK. The eraly releases until +/- 20th release are completely different from the 30-50 period, but as different as they are, both halves of the catalogue are great in their own category..
My great sentiment for the "97-99 sound" is deeply connected to the list of records you were looking at a minute before you read this comment.. 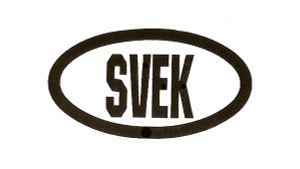 Does anyone know what Svek 045 is? I have it as a white label and there isn't much information on it. This is one of the coolest underground dance labels ever conceived. Astounding electronic beat music. i am just buying from this label piece by piece for a low price over the years and i am also surprised about the high quality! prime label. I'm truly astounded that NO one has taken a moment to inscribe a few choice words of what can only be described as one of the most seminal labels of the last ten years. While some of the latter releases seemed to lose a little steam, the first 35(roughly) absolutely REEK of quality. They cranked out everything from minimal bleep, to smoky and sultry deephouse, to acid jazz & downtempo, to bangin' Swedish techno. One common denominator is CLASS, regardless of the sound. They put several artists on the map including Jesper Dahlback, Alexi Delano, and Cari Lekebusch. If you haven't familiarized yourself with this imprint, do yourself a favor and try to at least hunt down the compilations on CD. Finding the early 12"s might be a rather tedious(and costly) venture these days. If you're feeling so adventurous, my personal recommendations are the: Kaos EP, Knockin Boots(1&2) EP's, The Persuader(Svek 011) EP, The Lod EP, Midsummer EP, Fallbacklick's EP, and Stockholm LP. Absolutely CLASSIC, TIMELESS, and ESSENTIAL.